This was supposed to be a trip into the Trinity-Alps or some other mountainous area. Unfortunately we were in the midst of a lot of fires burning simultaneously, so Daniel and I were essentially smoked out of the mountains. 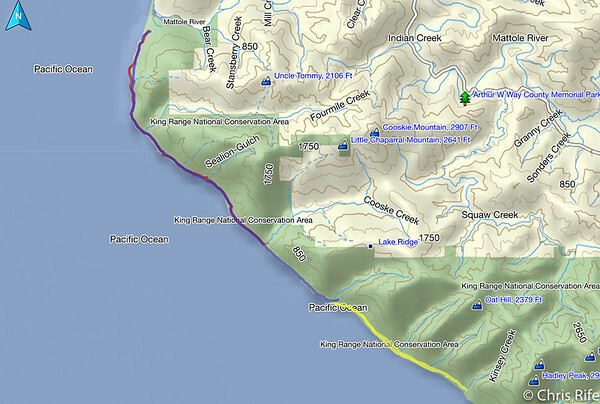 Given that we also wanted to be within a couple hours of Eureka when we finished, we decided to do an out-and-back along the Kings Range of the Lost Coast. I was a little apprehensive, but in the end this was an excellent trip. Not too much smoke, and lots of scenery that was- not surprisingly- quite different from my normal trips.